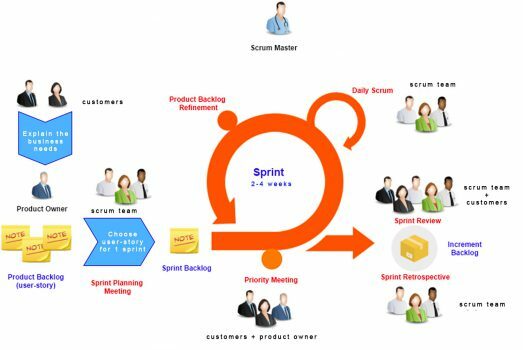 What is Sprint Planning in Scrum? This is the opening ceremony of the sprint that is essential to organize properly your sprints. We will see how to implement this sprint planning in Scrum. Sprint Planning is the opening ceremony of Sprint before starting Sprint. There is little value in starting a Sprint without preparing it; it is difficult to work without having a vision of the work to be done. It is essential that the Product Owner concretely define the sprint objectives at the beginning of Sprint Planning. The team will have a clear vision about the way to follow. we don’t risk putting pressure on the team. I let you decide whether or not you want to apply this rule but I had a lot of positive effects applying it; I recommand you to do this practice. When the objectives are defined, do not hesitate to remind them throughout the Sprint Planning or even write them directly on the board. You can also let them display throughout the sprint on your visual management. Now that our goals are set, the team will have to re-estimate the story point of each items of the previous sprint that ended in “work in progress”; it is very likely that the story point of these items will not be the same because the team has already worked on them. For those that want to do predictibility, we keep the highest story point for calculating velocity (and for predictability) and the final story point assigned for the current sprint (to better determine the team’s capacity to the sprint and on the Burndown Chart). 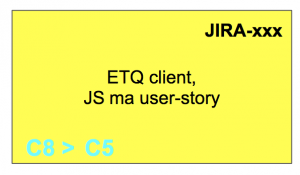 In this example in picture, the team redefined the story point to 5 while it was 8 during the previous sprint. We will consider 5 in story point for the team’s capacity to do and we will remove 5 on the Burndown Chart when it will be Done. On the other hand, we will put 8 in the sprint velocity in order to manage well our predictability. This work of re-estimation will be done on all the requests concerned before continuing. I remember that this work is useless on the requests that were already in “todo” during the previous sprint. 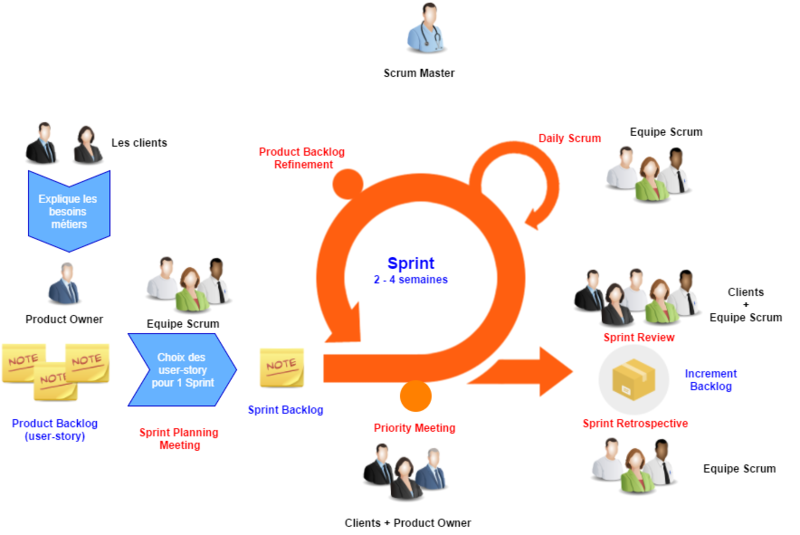 The Product Owner will offer developers all the items they will have to develop during the sprint. These items will generally meet the objectives set at the beginning of the ceremony. He will have to respect the capacity of the development team to avoid putting this team under pressure. This will materialize by limiting the number of items put in the sprint. In general during the first three sprints of the team, developers are often asked to determine themselves what they are capable of doing during the sprint (explaining to them that the estimation error is really not serious). If we still estimated of Sprint Planning in the past, it has become rather rare to do so; it’s totally justified. Now we only do the re-estimations but never the new estimations. We risked having to refine the items (mainly user-stories) in live because the PO had not necessarily thought of everything when he wrote them. He will also be forced to build his sprint backlog in live and perhaps to have to review his goals during the ceremony. All these points multiplied the need for time-consuming and we could quickly end up with a ceremony of half a day; we add the tiredness and the loss of attention to stay hours in meetings and we ended up with a format not necessarily more productive. Now, we do the Product Backlog Refinement to refine the user stories and to do the estimations. By following one of these two concepts above, the PO will arrive in Sprint Planning with the objectives of the sprint and its content. For the PO, instead of being left with an uncertainty of 40% on the content of the sprint, he will have 90% of the sprint defined. If the Product Owner urgently needs an exceptional estimation of a user-story from the backlog that is very simple but essential to process, the development team must not reject the estimation. We are in agile projects so we must know how to adapt. We must not make the mistake of following everything to the letter if it’s bad for operation. And in this case, it will be not an issue for the team. When the whole sprint is defined, the technical team will have to split each of the items into technical sub-tasks. One item can be represented by only one technical sub-task. Exact rules don’t exist for this technical splitting; I advise the technical teams to make the splitting as comfortable as possible for themself. Your developers have to choose the most refined and simplest splitting for themself; it’s useless to impose them a kind of splitting. When all items are splitted, the sprint planning session is closed and developments can begin; we then say that the sprint starts. Sprint Planning is the Scrum ceremony to start a sprint. I hope this article will help you put your Sprint Planning in place. Next PostNext LeSS agile framework?